One in five of us has a neurological condition. There are hundreds of brain conditions and we fund the best research to discover the causes, develop new treatments and improve the lives of those affected. We inspire scientists and families to come together, side by side, stride by stride. 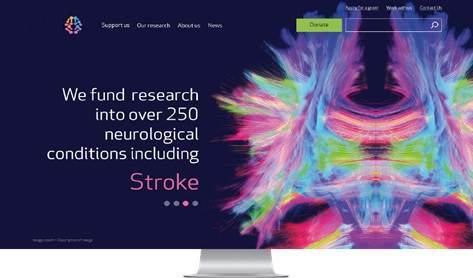 With a new corporate strategy, the charity changed its charitable objects to become a national funder of neurological research. We knew we had to update our brand to match our ambitions. We followed a four stage brand development process (discover, define, design, deliver) based on CharityComms best practice guide Branding Inside Out, together with our agency partner, The Team. We started by conducting desk research to extract insights from our supporters. Then we conducted market analysis to see how we could potentially standout. Observing that an increasing number of brands in the charity sector are ‘fighting, beating or conquering in tone, especially research ones, we wanted to create a brand with a more optimistic outlook. Images of brain activity can be awe-inspiring. Their beauty and complexity is fascinating. So we drew inspiration from a tractograph brain scan by M. Chamberland and M. Descoteaux from the Sherbrooke Connectivity Imaging Lab. We started this stage by deciding what brand strategy we wanted to follow. Should we pursue the more common charitable vision, mission and values, or a commercial purpose, promise and personality? As more and more corporate brands are now defining their social purpose beyond profit, we opted for the latter. After a Brand DNA workshop with key staff, scientists and supporters, we developed a couple of options for what the brand might stand for, which we researched with potential and existing audiences. Each option was brought to life with a brand story, a mood board (a montage of images to demonstrate the brand’s personality), and a shortlist of straplines. The research demonstrated the need to balance our positivity with empathy. Putting people’s real life stories at the heart of the brand, saw ‘humanity’ defined as a value with an emphasis on improving the quality of life of people affected by one of hundreds of neurological conditions. Our name with the accompanying strapline ‘inspiring progress, together’ is a strong call to action for scientists and families to unite, inspired by our simple human truth: the whole is greater than the sum of its parts. A new brain symbol radiates positive energy and provides a shortcut for social media purposes. The colour palette is inspired by the tractograph brain scan and is deliberately multi-coloured, as many brands in our sector lead with cyan and magenta. The logotype is set in Apex rounded font and follows the original logo’s composition; right aligned to signify moving forward. Photography styles have been defined to reflect each of the brand values (humanity, unity and positive energy) to tell the brand story and create an emotional arc. By overlaying a brain scan on to a photograph we can create a sense of positive energy to provide stand-out. At the same time as developing the brand we devised a digital and social media channel strategy and customer journeys to drive people to our new website. Together with a short film to bring our new brand purpose and story to life. We hope you like it as much as we do. The brain is the most complex organ in our body. It controls our emotions, senses and actions. So when it breaks down, we break down. It doesn’t have to be this way. We identified an opportunity for a brand with humanity, unity and positive energy; a brand to accelerate the growth of a great charity. We briefed The Team to review our brand and to create something that would support and drive our ambitious strategy for growth. Our new look and feel is warm and engaging and brings a human element to our medical research. It gives us the tools we need to progress as a national charity, funding the best neurological research in the UK. Read more about Brain Research UK’s brand story. Check out the slides from Kellie’s presentation at Brand Breakfast.